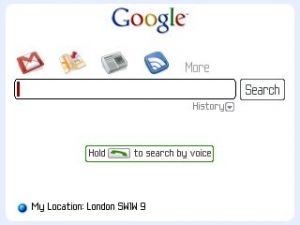 Google Mobile App for Blackberry with Search by voice and My Location | BlackBerry Blast! Google Mobile App on your Blackberry will now let you search with your voice and with My Location. You can give it a try by going to m.google.com on your BlackBerry's browser. Unfortunately, the BlackBerry Storm is not yet supported at this time. "Suppose you're vacationing in London, and you have a craving for fish and chips. With the My Location feature enabled, you can just enter "fish n chips" into Google Mobile App, and it will return the fish and chips restaurants closest to you. No need to type in "fish and chips near SW1W". And since Google Mobile App displays search suggestions as you type, you may only need to type part of the query before "Best Fish n Chips in London" pops up as a suggestion. We're a fan of anything that saves keystrokes on the way to deep-fried British goodness."